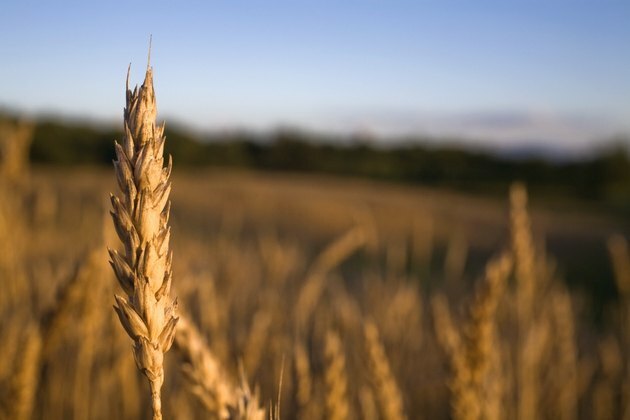 Wheat dextrin is a versatile product that is primarily used in the textile, adhesive and food industries, and as a dietary fiber to improve digestion. Wheat starch is chemically processed to make wheat dextrin. It is used globally and has many commercial uses, along with various health benefits. Dextrin is a hydrolyzed starch made from various starches such as potato, corn, tapioca, rice, arrowroot or wheat. Wheat starch is a byproduct from extracting gluten from wheat. The wheat starch is sprayed with acid while being agitated and then suspended in water by the acids or enzymes. After maturing, the wheat starch is dried in a roaster where it is continually heated and stirred. The converted dextrin is then taken from the roaster and cooled. It is humidified before packing to keep the dextrin from getting lumpy or foaming. Heating times and acids vary depending upon the manufacturer and the final product usage. Wheat dextrin is widely used in the food industry as a food thickener in packaged soups, sauces, sweets, baby food and as a replacement for fats in reduced calorie foods. Wheat dextrin is also a good source of dietary fiber. Wheat dextrin is one of various dextrins used in the textile industry for printing cotton fabrics. It is also used as an adhesive for porous substances, in the paste on envelopes, labeling adhesives, postage stamps, gummed tape and a variety of other adhesive uses. Wheat dextrin is a water-soluble fiber that can help reduce cholesterol levels, help boost immune function, improve mineral absorption and help you reduce excess body fat, according to a review published in the 2009 issue of "The Journal of International Medical Research." Wheat dextrin improves your body's absorption and retention of minerals and nutrients, while improving your immune system function, according to a 2004 study in the "European Journal of Nutrition." Ten patients were fed wheat dextrin over a 31-day period. The study found the wheat dextrin helped improve digestive disorders such as constipation and improved the absorption and retention of calcium and magnesium. Wheat dextrin used as dietary fiber may cause slight stomach pain, bloating or gas. While wheat dextrin is considered a gluten-free starch by the FDA's definition, small amounts of wheat may be digested or the product may contain some residual gluten. People with celiac disease should consult their physician before consuming any product containing wheat dextrin.